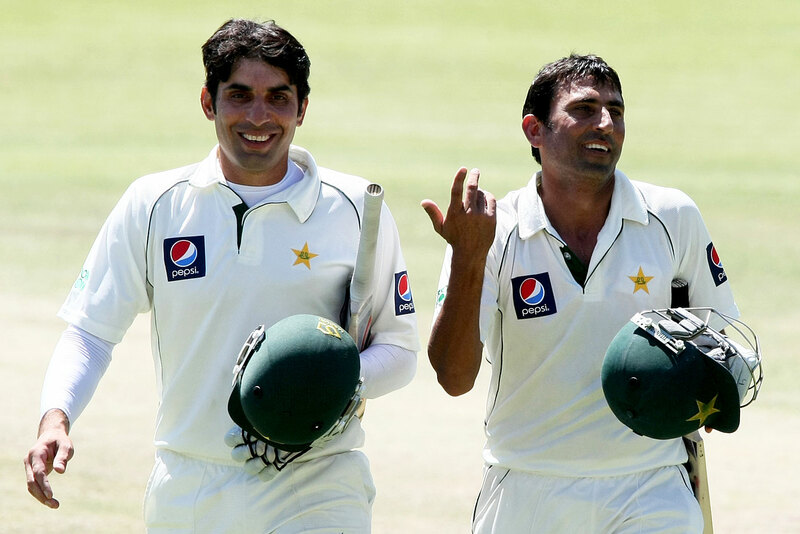 The 2010s has been a decade for senior batsmen in Test cricket. Many have shown that advancing age has no correlation with diminishing returns in this format; if anything, there has been a reverse correlation with age. Shivnarine Chanderpaul, Kumar Sangakkara, Misbah-ul-Haq, Sachin Tendulkar and Jacques Kallis are among the batsmen who have demonstrated that the gains in experience far outweigh the age-related handicaps of poorer hand-eye coordination and slower movements. For any sportsman, the effects of age on skill are a concern, but in cricket, the fact that two completely different skill sets are required means these effects don't apply equally to batsmen and bowlers. Batting is an art where you need time to mature - the skill to bat long periods calls for great powers of concentration, which can only be honed through hours of practice and regular match play. 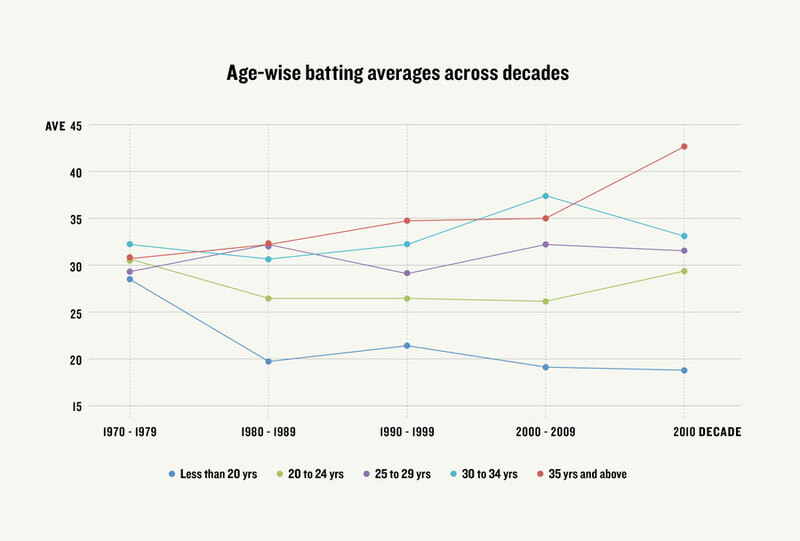 An age of around 32 is reckoned to be the best for batsmen, but in the current decade, older has definitely been better. Since 2010, batsmen over 35 have averaged 43.36, which is much higher than the averages for the same age group in earlier decades. It is also higher than other age groups have averaged in this decade, and by a significant margin as well. The 2010s has also been a period when several batting greats have gone past the age of 35, and haven't let their age affect their run-scoring. Eight batsmen in this period have scored 2000-plus Test runs after turning 35, and seven of them have averaged more than 50 while doing so; the only exception is Rahul Dravid, and he averaged a pretty healthy 46.18. There is little doubt that most international players above the age of 35 have plenty of ability - else they wouldn't have lasted that long - but they are also often subject to greater scrutiny, and have a smaller margin for error. Losses of form that would in a younger player pass off as a temporary are thought to be symptoms of an age-related - and hence irreversible - decline. Between 2000 and 2009, only three players - Steve Waugh, Brian Lara and Alec Stewart - scored 2000-plus Test runs after turning 35, and two of them, Lara and Waugh, averaged more than 50. In the current decade, older players have proved to more durable. You would think age might be a bigger handicap for bowlers than it is for batsmen. Stats clearly show that fewer bowlers have managed to extend their careers for a reasonable period beyond 35; players tend to know that their powers are waning and quit before they are pushed, while selectors tend to be less patient with bowlers than they are with batsmen. Since 2000, bowlers over the age of 35 have picked up less than a seventh of the wickets taken by those between the age of 25 and 29. However, some great bowlers have managed to defy Father Time, performing at very close to peak levels even when older. Which is why the overall average for bowlers over 35 since 2000 is a highly respectable 32.30 (see table below). That is better than the averages for bowlers between 20 and 29, and very nearly as good as those between 30 and 35. The big reason for this: very few bowlers manage to survive that long, and those who do are clearly a special lot. Since 2000, only five bowlers have taken 75-plus wickets in Tests after turning 35, and four of them averaged less than 30 in doing so. 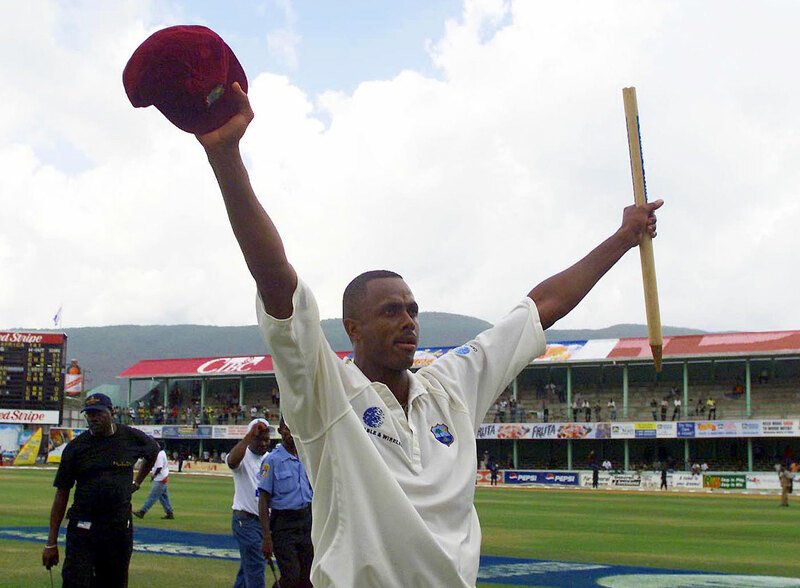 Courtney Walsh took 180 Test wickets post 35 - third only to Clarrie Grimmett and Shane Warne in the all-time list - but 93 of those wickets came after 2000, at an average of less than 20. 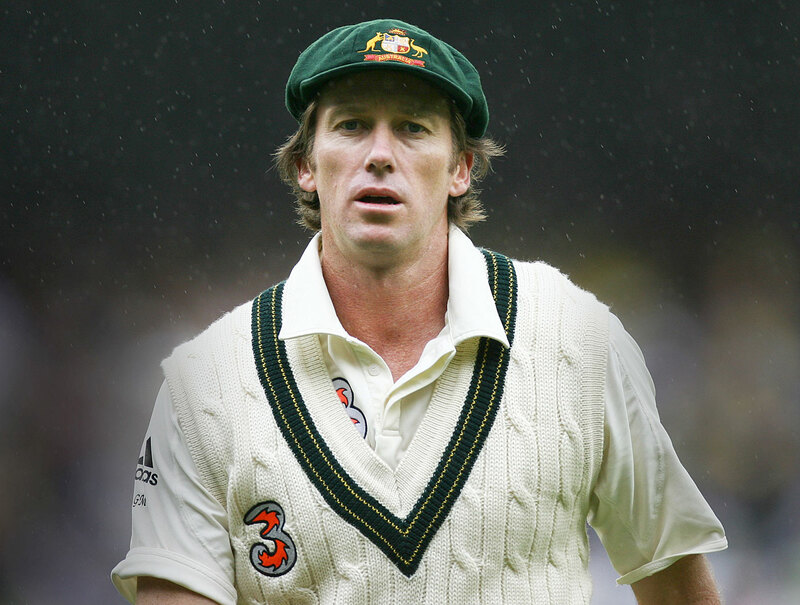 Glenn McGrath and Warne were outstanding too, while Muttiah Muralitharan and Anil Kumble round off a list of greats. 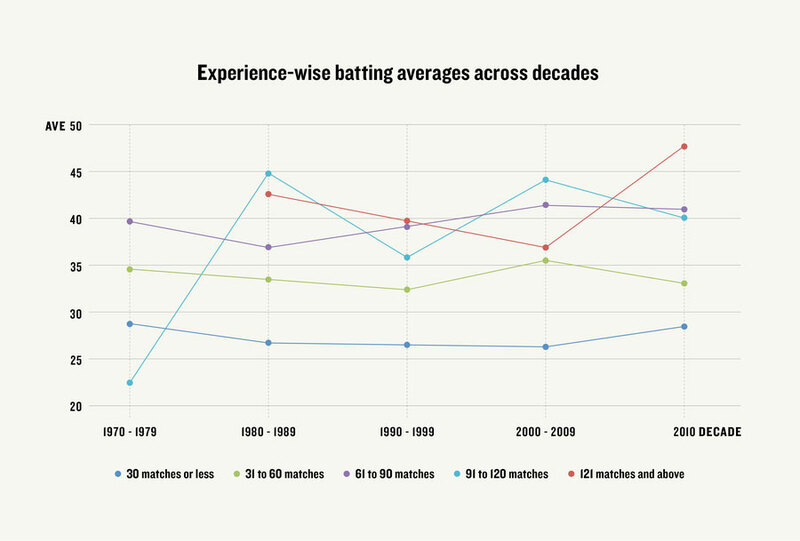 The stock of 35-plus batsmen has been rising over the years: in the 1970s they averaged 31, and since then there has been a steady rise each decade. Another indication of their rise is the percentage by which they have exceeded the overall average in each decade: in the 1970s they were 0.7% above the overall average (30.98 to 30.76); in the 1980s it went up to 6.5% above average; in the 1990s to 18.8%; in the 2000s to 10.4%; and in the 2010s to 32.4%. In no other age group has there been a constant increase in averages over the last four and a half decades. The 30-34 age group has consistently done well too: in the 2000s they had the best average among all age groups, thanks to batsmen like Matthew Hayden, Ricky Ponting, Dravid, Kallis, Lara, Chanderpaul and several others. Many of them moved to the next age category in the 2010s, and kept the flag flying for the 35-pluses. With most of them retired now, it is time for the next generation to move through the ranks and step up. 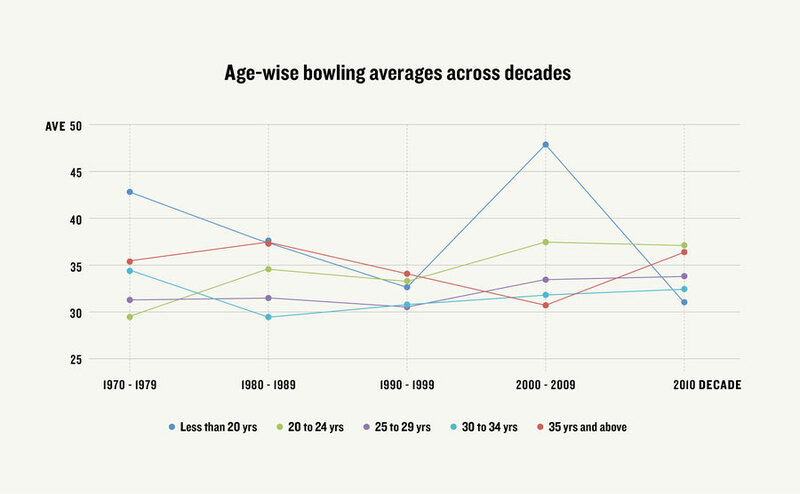 For bowlers, the best age category over the last few decades has been 30-34. In the 1970s, the younger lot did much better than the rest, but gradually, with better training techniques, more and more bowlers have been able to delay the inevitable. At around 30, bowlers have the benefit of understanding their game and their body better, thanks to having spent a few years on the international circuit, and also to maintaining or improving their fitness levels. That has generally worked well for bowlers in the 30-34 group: since 1980, they have averaged 31.17 runs per wicket, compared to 32.30 for bowlers in the 25-29 category. The latter group, though, has significantly more wickets - 16,756 to 9603 - implying that not all bowlers are able to maintain their rate of success in their 30s. You would assume that players have already played a few Tests by the time they turn 30, but that depends on the age they debut. Alastair Cook had played 109 Tests by the time he turned 30, while Tendulkar had 105, but Paul Collingwood had played only ten, Dean Jones 11, and Michael Hussey made his Test debut after turning 30. Data over the last few decades suggests that batsmen come into their own only after playing around 60 Tests. That is at least around five to six years into a batsman's career, which suggests selectors need to back a player over a reasonable amount of time to be able to see the best. 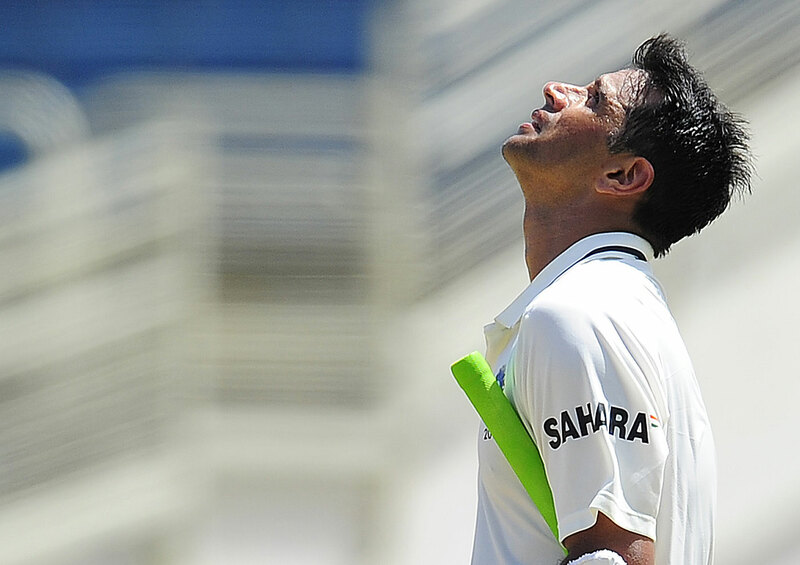 Dravid, for example, averaged almost 51 in the first six years (age 23 to 29) of his career, in 55 Tests, but then lifted his game to a different level in the next four years, averaging 66 in 46 matches; during this period he averaged 100 in wins, 92 in Australia and 100 in England. Sangakkara, another who debuted at around 23, averaged about 47 in his first 60 Tests - over six years - but since then has averaged more than 67 in 72 matches. The key for batsmen is to ensure they do enough in the first six years so that the selectors keep faith in them; the good ones invariably manage to do so. For the bowlers, age and experience helps to a degree. The first 30 Tests aren't usually very productive, but thereafter the averages improve quite dramatically. Since 1990, bowlers have averaged 35 in their first 30 Tests, a little more than 31 in their next 30, and slightly over 28 between Tests 61 and 120. However, a vast majority of bowlers playing during this period have between one and 30 Tests' worth of experience - such bowlers have taken more than one and a half times the wickets that the other four categories put together have taken. That is more than the corresponding ratio for batsmen, but it is to be expected. Bowlers don't usually last as long as batsmen. One of the few bowlers who maintained his effectiveness right through a long career was McGrath. He averaged 25.48 in his first 29 Tests, but then moved up a gear and stayed there, averaging 20.59 through his next 95 Tests. James Anderson averaged 35.42 through his first 36 Tests, but since then his average has dropped to 26.91 in the next 68; the challenge for him is to maintain those numbers through the rest of his career. Dale Steyn picked up the tricks of the trade a little quicker: he averaged 25.25 in his first 16 Tests but has averaged 21.91 in his next 62. The numbers grouped by age and experience yield two different sets of data. So let us use both filters and see which intersection of data yields the highest averages. Taking 1970 as the starting point and grouping by age and match experience, the set with the best average is players in the 35-plus age group in the 2010s with an experience of more than 120 games. It has already been established that we have seen some truly great batsmen all nearing the end of their careers in this period, and almost none has seen his abilities diminish with age. Many among this group were also in their early 30s in the previous decade (2000-2009), which explains the high averages for players in the 30-34 age group who played 91 to 120 Tests in the noughties. Between those two rows, though, is some data that shows the emergence of the next lot of talented batsmen: in the 2010s, players aged between 25 and 29, with experience of 61 to 90 Tests, have averaged almost 47. Batsmen like AB de Villiers and Hashim Amla have come into their own and taken over the mantle from the previous generation of superstars. There are three representations for the over-35 brigade in the table for top eight averages, which suggests that advancing age does not by itself result in diminishing returns for batsmen. Among the bowlers, a similar list is dominated by groups in the 30-34 age category, implying that it is a phase when bowlers understand their craft and their bodies, and are able to optimise effort to ensure the best results. 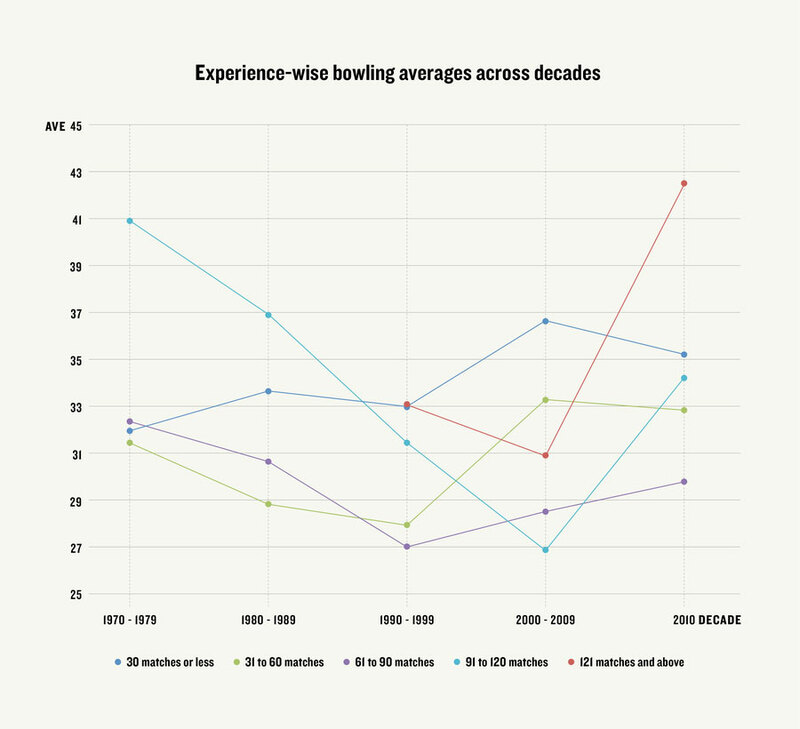 It has worked for bowlers in three successive decades since the 1980s, with only the experience range increasing with each ensuing decade. In the 2000s, several top bowlers, including McGrath, Muralitharan, Kumble, Warne and Shaun Pollock, were in that category, which helps explain an average of 26.53; in the 1990s there were other, equally skilful bowlers, including Allan Donald, Curtly Ambrose and Courtney Walsh; and in the 1980s, Dennis Lillee, Richard Hadlee, Bob Willis and Joel Garner were among those who propped up the 30-34 brigade. It isn't surprising that for most of these greats age was just an irrelevant number.